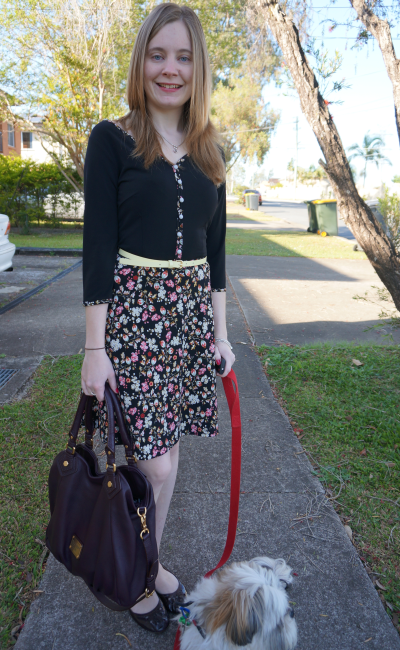 Linking up with Style Sessions, My Style Monday, Trend Spin Linkup today. Last worn: colour block tee, studded sandals, Miu Miu studded bag. First time I've worn the belt as it is a new purchase. Had to go back to the office today, so wore a simple dress to try look more pulled together than I felt, haha. tried to add a bit of cheer with the yellow belt. The pink one probably would have looked better though I think. Was maybe a little optimistic with going back to work so soon, but I had to get a few things cleared up before a big meeting out of state tomorrow. Does anyone have any survival tips for flying with a cold? Last worn: Leona Edmiston dress, brown shoes, Marc by Marc Jacobs Fran bag. First time I've worn the belt as it is a new purchase. You look super adorable in both outfits! They are very feminine and beautiful! really love ur studded bag!! very pretty skirts..both of them!! the miu miu bag looks awesome here, loveee the studs! I love all of your bags always! haha. Mica, I hope you feel better soon. Traveling while sick is the worse. Get plenty of rest doll and load up on the fluids. Love your skirt and dress. So pretty. Loving the Miu Miu bag! You look lovely! I adore the floral skirt. That pink belt is so perfect with your striped skirt and I really like the pop of hot pink on the back of your shirt! 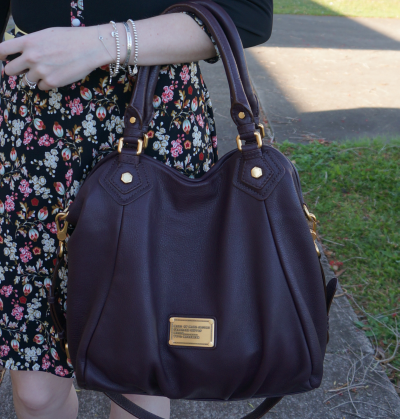 Your Marc Jacobs bag is fabulous, too! omg!! i love that first studded bag! so unique! i love the pretty floral skirt! and i'm so envious of your bag collection! I adore the Miu Miu purse! And love the yellow belt in the 2nd outfit - such a great pop of color. I just love both your skirts in these outfits! I love both of these skirts, they are really cute! Feel better! I want that miu miu bag! Oh! I just wanna squeeze the puppy! Love the look! You look pretty despite being under the weather. Love the bag! The color is so earthy yet a bling. I really like how you don't dress up and go over board for the pics and keep your looks natural and underdone. BOTH your bags are gorgeous and I love the floral!